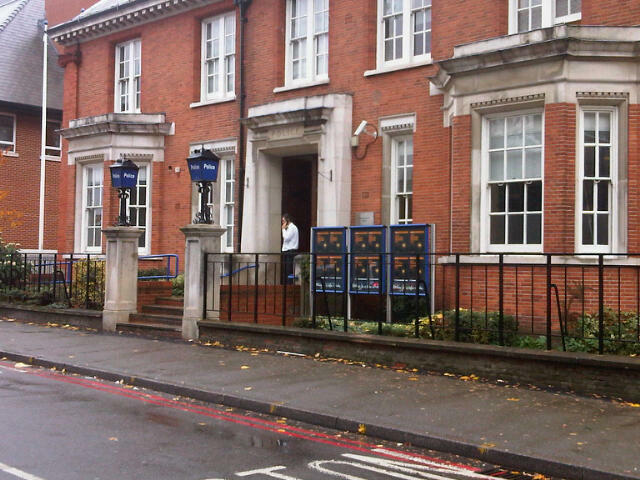 Sutton police station is just outside our Ward, in Carshalton Road. In November 2017, after a long consultation to which the Council contributed, the Mayor of London announced the closure of counter services at a swathe of police stations across London. We campaigned to save the service at Sutton station, and were successful. Sadly, it was announced that the counter service at Worcester Park station would close. Shame on you, Sadiq Khan! Now the Mayor has merged Sutton with Croydon and Bromley, a move bound to lead to resources being drained from Sutton to these higher crime areas. The Sutton South Safer Neighbourhoods Team is led on the basis of a shared Sergeant with Belmont Ward. Sutton South is, relatively, a low crime area. Aside from figures given to the Ward Panel meetings, we undertake an analysis of crime figures for Sutton South Ward. The figures demonstrate that Sutton South has lower crime levels overall than the rest of Sutton, which is itself a low crime area compared to other London Boroughs. Sutton has consistently been one of the safest Boroughs in London. Nonetheless Trish and Richard, the police, the Council and other partners recognise that feeling safe is one of our residents’ most important priorities. By 2017 crime had reduced by 35% since 2005-06 when the Metropolitan Police and Sutton Council set up a jointly managed service to run the Borough’s community safety services. This includes the local Safer Neighbourhoods policing teams, Council funded Safer Parks police teams and CCTV. DO YOU HAVE VIEWS ON HOW SOUTH SUTTON IS POLICED AND WHAT OUGHT TO BE THE PRIORITIES FOR POLICE ACTION? LET US KNOW. IT WILL HELP US IN OUR CONTINUING DIALOGUE, ON BEHALF OF THE COMMUNITY, WITH THE LOCAL POLICE, ON HOW SUTTON SOUTH CAN BEST BE POLICED. AND LET US KNOW IF YOUR HAVE IDEAS ON HOW THE WARD PANEL, THE VEHICLE FOR CONSULTATION WITH THE COMMUNITY, CAN BE MADE MORE REPRESENTATIVE. The Sutton South Safer Neighbourhoods Team can be contacted by clicking on this link. In Sutton you can call 101 to report a crime that has already happened, seek crime prevention advice or make the police aware of any issues in your local area. Using 101 for situations that do not require an immediate police response helps keep 999 available for when there is an emergency. An emergency is a crime happening now or immediate danger. If you have any information you wish to provide to the police anonymously contact the Crimestoppers charity on 0800 555 111. We both attend the local police consultative panel. We have sought to expand the membership of the panel to make it more representative of the area and it now meets in public. Reports on some significant recent meetings are provided below. This meeting was chaired by Amie Stacey, who lives in Upland Road and has recently been appointed Ward Co-ordinator for Sutton South. The police were represented by PCSO Laura Jagoe, from Sutton South Ward and PC Adam Nawol from Cheam Ward. Non-urgent contact details for the Safer Neighbourhood Team (SNT): suttonsouth.snt:met.police.uk; 020 8721 2497; 07920 233862. The police reported that in the period December to March, there were 16 burglaries and 21 vehicle crimes in Sutton South Ward. Common methods of entry included getting over a back gate and entering from the rear of the premises by breaking a door or window. We were advised to link a burglar alarm to a call centre, rather than rely on a neighbour. Car thefts were mainly opportunist, some people forgetting to lock their cars. Drugs were not viewed as a big problem, incidents being very sporadic and tackled quickly, after which the drug sellers would move on to somewhere else. As usual, the police SNTs are seriously undermanned. Over the 4 wards, viz. 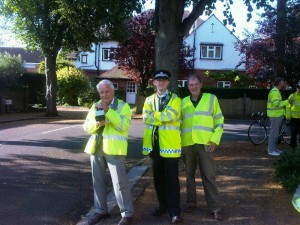 Sutton South, Cheam, Belmont and Sutton West, there are 1 sergeant, 5 PCs, of whom only 3 are “operational” and 3 PCSOs. There are supposed to be 8 PCs, 2 per ward. We were told that there is a PCSO recruitment campaign. Great concern was expressed by all at the meeting and letters will be sent by Neighbourhhod Watch to MPs and the Mayor of London. 999 calls are handled by an Emergency Response Team. Lisa Webster, Road Co-ordinator for Upland Road, reported her success in bringing residents of that road together through social events including a “Community Cuppa” meeting on 6th March at her house, 101 Upland Road, to which 26 people came between 1.30 and 3 p.m. The first meeting for a long time as the summer meeting was cancelled at a late point due to it being on the evening of one of the football matches England were involved in in the World Cup. A meeting that left us feeling worried. An increase in crime, in burglaries and thefts from motor vehicles, was reported for the first time for some time. This may not be unrelated to problems of police numbers following the merger with Croydon and Bromley. There are a significant number of unfilled posts, vacancies, that the police are struggling to fill, particularly PCSOs. These are important for work on community relations. One member of staff is about to be moved to work in Croydon, though she did not request this move, and we are again losing our Dedicated Ward Officer. Kellie Heath is also being moved to Croydon. A better attended meeting, the highlight being an animated discussion of what can be done to deal with anti-social behaviour outside Sutton station, particularly the racist abuse of the owner of the flower shop. Crime remains low in the area. The staffing problems of the local police force have been ameliorated somewhat. Concern was expressed about the merger of Sutton, Bromley and Croydon police forces as resources will be drawn away from low crime Sutton to higher crime Croydon, but it seems this is to go ahead come what may. Not a well attended meeting, but the first chaired by our new chair Frank Berry. Crime remains low. Homelessness is on the increase nationally and here in Sutton and the meeting discussed measures to deal with it. There was concern at staffing levels, with one PC post unfilled for some time and the PCSO away on maternity leave. The meeting learned that our new Dedicated Ward Officer, PC Kellie Heath, is fitting in to her role and has been very active in meeting local community groups. Although the revised policing model promised by Borough Commander Mark Lawrence promises two Dedicated Ward Officers, supported by a PCSO, by the end of 2017, Kellie is at the moment something of a one woman band. At the Sutton South Ward consultative meeting with the local police on 11 June we learned that our long serving PC, Mark Towler, is moving to other duties. There is a new policing model being adopted and our Ward will be under Sergeant Anna Smith – who also covers Cheam, Belmont and Sutton West – but with two dedicated Ward officers – Kellie Heath and Andy Peak – plus a PCSO (Laura Jagoe, who has been with us a long time but is currently on maternity leave). We recorded our grateful thanks to Mark, who will be missed. 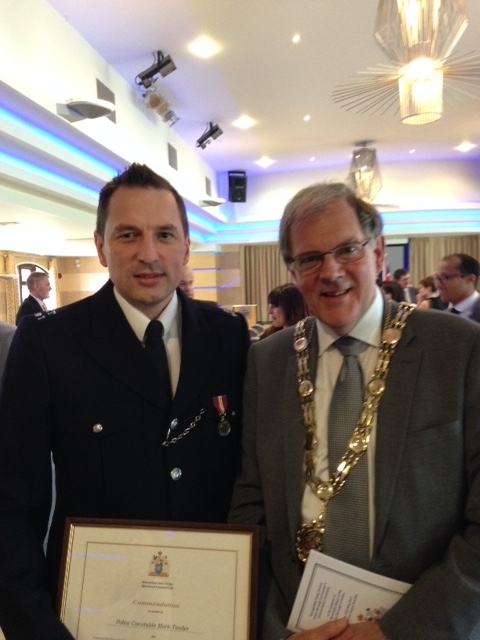 This is a picture of Mark when he received an award for his work from Richard, during Richard’s year as Mayor. The meeting heard that Sutton South remains a low crime area with just two house burglaries, though four garage burglaries, in the previous twelve weeks. The sector priorities remain tackling burglary, anti-social behaviour and speeding, while for our area we asked the police to continue to keep an eye on drug use at certain addresses, speeding and action to deal with all-day drinking. Trish and Richard attended the Ward police consultative committee meeting on 10 January. The police again reported that crime in our area remains low. In the final quarter of 2016 there were 3 residential burglaries in our Ward (down from 6 in the corresponding period a year previously), 3 non-residential burglaries (down from 7), 7 thefts from motor vehicles (down from 12) and 2 thefts of motor bikes. The police had executed a number of drug searches in the last quarter, which they felt had had a positive impact. Priorities continue to include drugs, looking out for rough sleepers in stairwells of blocks of flats, anti-social behaviour at bus stops, speeding checks and aggressive begging around Sutton station. The police consultative panel next meets at Christchurch hall in Christchurch Park on 9 May. This is a public meeting. See if you can come. There were several “Speedwatch” events in the last quarter, some involving students from Overton Grange school, using a speed gun to catch and warn speeding motorists. On 12 July Trish and Richard attended the police consultative group meeting for Sutton South Ward, held in the church hall at Christchurch. It is a pity these public meetings attract so few members of the public, only four tonight. The police priorities for the next quarter will include seeking Neighbourhood Watch co-ordinators at Farm Close and Audley Place, and tackling the problem of rough sleepers in Ambleside Gardens and Beauclere House, in Brighton Road. There was also discussion of the theft of bins at blocks of flats in Brighton Road and in Christchurch Park. Trish and Richard attended the Police / Community Ward panel meeting held on 19 April. The panel expressed concern over a spate of burglaries, particularly in the area of The Ridgway and Mayfield Road. This was the first meeting for our new sergeant, Sergeant Nicholson, who was previously working in Brixton. He commented on the fact that the number of burglaries in our Ward in the previous six months was 23, compared to over 200 in the area he came from in Brixton. Despite the current spate of burglaries we remain a low crime area with residential burglaries low in number. dealing with night sleepers at Beauclere House in Brighton Road. Trish and Richard attended their first local meeting of 2016 when they attended the consultative panel for Sutton South Ward set up by the police, on January 5, in Christchurch hall. The police had reported at the previous meeting that that there had been a further fall in the total number of crimes in our Ward in the most recent three month period, a fall of 1.5% compared to the period a year previously. The downward trend has continued and data were presented to the meeting to show that the number of residential and non-residential burglaries in the last four months are down compared to the figures for the corresponding period in 2014. Sutton South Ward continues to have one of the lowest crime rates in London. It will be difficult to reduce it further. Priorities remain tackling burglary, anti-social behaviour and speeding. The police are continuing to conduct some evening and night patrols with the objective of tackling rough sleepers in certain blocks of flats. The threat to the future of PCSOs (Police Community Support Officers, the backbone of our neighbourhood policing approach) remains a matter of concern. An exercise to test public satisfaction with the police has found that satisfaction rates are highest in Sutton, of all London boroughs. Trish and Richard attended the meeting of the consultative panel for Sutton South Ward set up by the police, on October 13, in Christchurch hall. This was the fourth meeting held in public and there was an almost full attendance of members but no members of the public. The police reported that there had been a further fall in the total number of crimes in our Ward in the most recent three month period, a fall of 1.5% compared to the period a year previously. The police officers attending the meeting complained that this was still below the target figure set by the Mayor of London’s policing unit, but that as Sutton South Ward has one of the lowest crime rates in London it would be difficult to get down the the figures they have proposed as targets. Priorities remain tackling burglary, anti-social behaviour and speeding. The police reminded us of their “Autumn nights” initiative to persuade residents to leave a light on if out during the evening, to create the impression the house is occupied. The police also intend to conduct some evening patrols, partly with the objective of tackling rough sleepers in certain blocks of flats. The meeting discussed an initiative in Wandle Valley Ward called “Streetwatch” involving residents patrolling the streets. There was concern about this proposal. The threat to the future of PCSOs (Police Community Support Officers, the backbone of our neighbourhood policing approach) was also a matter of concern. A good meeting with a high turnout of panel members and some members of the public. There was a long discussion, prompted by a member of the public, of a burglary in Albion Road, and what the police meant when they say they have “closed” the case. They mean it is still to be pursued if new evidence arises. Police priorities continue to focus on vehicle speed checks and thefts from vehicles. There was praise for the talk given to Sutton South Hello! by Sergeant Coles on scams. The second meeting held in public and perhaps slightly disappointing that while there was a much better attendance of members than last time there were no members of the public. Good news that there has been a major decline in anti-social behaviour across the Borough. Comparing the figures for crime in the Ward for the first three months of 2015 compared to the same months in the previous year burglaries of houses have fallen from 10 to 8, burglaries of garages are the same at 6, thefts from motor vehicles are down to 5 from 14, and thefts of motor vehicles down to 1 from 3. The police have completed the promises given last time to undertake a bicycle marking scheme, to target thefts from motor vehicles at specific locations and undertake speed checks in specific roads. They agreed to provide a speaker on police matters to a meeting of Sutton South Hello! and undertake speed checks in Langley Park Road. A major success as the panel met in public for the first time. Only 5 members of the public came to this first meeting, attended by Trish and Richard, at Christchurch. But a good start. This was not a well attended meeting. We spent part of the time discussing the recent changes to consultation arrangements introduced by the Mayor. They are not popular, and have led to the demise of the popular local Borough-wide consultative group. We discussed how we might meet in public in the future. The crime statistics presented by the police continue to show the Ward has low crime levels, with theft from vehicles one of the most common offences. Agreed priorities are burglary, theft from motor vehicles and anti-social behaviour. This was the first meeting held since the election so had some different members. It was the first meeting Trish attended, but former Councillor Heather Honour is still on the panel, which we warmly applaud. The higher level committee for the “sector” has now met. It was suggested that there is to be an even higher level committee to be formed. Priorities continue to be burglary, motor vehicle crime and assault, together with action on drugs, anti-social behaviour and traffic/speeding. There are relatively few assaults in our area, some burglaries and some motor vehicle crime. Anti-social behaviour and speeding are seen as priorities by residents. Crime figures were discussed a the meeting and some particular incidents. The Ward remains a low crime area but there was concern about some burglaries and cases of ASB. The police were congratulated on the success of a recent drugs operation at Sutton station. There is to be a further change of Sergeant. This was the most well attended meeting for a long time. It was somewhat dominated by a discussion of the future of the panel under proposals put forward by the Mayor’s office for Policing (MOPAC) to re-organise arrangements for the community to have a consultative dialogue with the police. Heather and Richard have expressed the view consistently that this is a step backwards and that successful arrangements in Sutton that work well will be disrupted. The Ward panels will no longer set the policing priorities. This is a backward step. Policing priorities for the Ward – no longer set by the local panel – are burglary, motor vehicle crime and violence with injury. This last priority is not relevant to Sutton South, which is a low crime area with few such crimes. The police agreed, at the meeting, to continue action on local priorities such as traffic and speeding. The meeting also heard from John Withersby, who is the Licensing Sergeant for the Borough, who is concerned about drinking and anti-social behaviour in the town centre. If you have a concern about some licensed premises phone him (in confidence) on 020 8649 0796. There was also a discussion of the progress of the Neighbourhood Watch scheme in the Borough. The police listed an impressive series of initiatives in the Ward, including what is described as “super cocooning” following burglaries – giving lots of advice and information to local people. 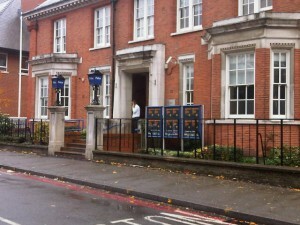 Heather and Richard attended the meeting of the Sutton South Ward Police Panel on 11 September. Members discussed latest crime trends. The panel sets priorities for police action in the Ward and the existing priorities were burglary (in particular theft from garages) and motor vehicle crime (in particular theft from cars). The panel decided to add a third priority, anti-social behaviour (paying particular attention to drug dealing). Heather and Richard attended the Sutton South Ward police panel on 12 June. There was discussion of current crime trends, including recent burglaries and attempted burglaries in Mayfield Road. Also, nine local residents attended their recent street briefing. While no-one can ever be complacent and we must all maintain our vigilance, it remains the case that this Ward is a low crime area, indeed one of the safest areas in south London. Burglary, along with theft from motor vehicles, remains a police priority for the area, but the most common form of burglary in our area is theft from garages, and residential (house) burglaries are mercifully rare. The meeting also discussed future action on speeding, a dog seizure in Cumnor Road, a cannabis factory in Westmoreland Drive and the success of the extension of the “No Drinking Zone” to our Ward. We also discussed the introduction of the “London Policing Model” on 24 June. While the implications are not all positive, these changes are not going to damage the excellent service we generally get from our local police. The police were again able to report encouraging crime statistics. The figures for the year to December showed a total of 107 crimes compared to 133 for the same period in the previous year. Burglaries had, however, increased, from 14 to 18. This reflects a rise in burglaries everywhere in Sutton. Thefts from motor vehicles were down from 17 to 9. Incidents where the police had to intervene in domestic arguments were down from 23 to 10. “Drive out” without paying from the one garage in our Ward were down from 14 to 7. In terms of crime trends, the police were concerned about bin thefts – the large metal bins, stolen for their metal. The meeting also discussed, inte alia, reviving the “Speedwatch” initiative, pizza delivery vehicles continuing to use the Wellesley Road passageway, people riding bikes on pavements and Metropolitan police re-organisation. The most alarming aspect of this meeting was that only 3 panel members, plus the police, turned up – the Reverend Mark Pullinger, Heather and Richard. The figures showed crime down 19% on the figures for the same period in 2011 – burglary down, theft much the same. There were increases in assault and in harrassment (in this context, this being an umbrella term for a variety of forms of anti-social behaviour) but some of this is close to the station and, while in the Ward, not involving our residents. Anti-social behaviour in the Ward is, overall, down. Other matters discussed included progress on the fence at the back of Forest Dene, incidents involving dogs, pizza delivery drivers, proposals we made for use of “Community Payback”, the pressure from the “centre” in London for more action on drug enforcement (which is stretching local resources), and the reasons for the decline in anti-social behaviour incidents in the Ward. It was agreed that the priorities would continue to be burglary and motor vehicle crime. The meeting was chaired by our Sergeant, Geraldine Costello. The panel congratulated the police on the latest crime figures, showing a 23% drop in crime in the year to date. There were some significant variations between categories, with assaults causing injury and harrassment both up. However, there were large falls in non-residential burglaries and criminal damage, which accounted for the overall reduction. The area remains a low crime area with the police confident they are on top of the overall situation. The panel discussed the three Ward priorities – drug use in the Brighton Road, motor vehicle crime and theft from garages. Theft from garages and motor vehicle crime have fallen but it was agreed that we want to keep it that way. It was agreed that drug dealing and use in the Brighton Road would be put into a “normal vigilance” category. Significant action also continued to be taken on theft of metal. – a cannabis factory in Ferndown Close. The meeting was pleased that the local police had kept things under control when the Olympics had placed a strain on resources, though the Sergeant felt this had been less of a strain than expected. While we were pleased the Olympics were now over and demands on police resources would return to normal, we felt the police had done a superb job during the Olympics. The panel congratulated the police on the latest crime figures, showing a 29% drop in crime in the year to date. The three Ward priorities were, it was agreed, unchanged as drug use in the Brighton Road, motor vehicle crime and theft from garages. Theft from garages has falllen but it was agreed that we want to keep it that way. It was noted that the police have taken positive action on dog fouling. A particular succes, of note, was to to agree an “Acceptable Behaviour Contract” with a dog owner in Cedar Road who accepted that she had let her dog foul the pavement. The meeting also discussed how to get best value from the work of “Community Payback”, finding new members for the panel and a new Chair. An incident of particular concern was a mugging in Mayfield Road, on which a press release had been issued by the police, as below. “Police are appealing for the public’s help after a 30-year-old man was attacked from behind and had his Gucci watch stolen. The man was on his way home from a friend’s house at approximately 23.15hrs after watching England lose to Italy on penalties on Sunday 24th June. He had walked from the Manor Park area, past the B & Q store and onwards into Mayfield Road when he was pulled face down on the pavement. His watch was grabbed from his wrist. The two, or possibly three, suspects ran off towards The Ridgway. The watch is a men’s Gucci watch, valued at £695, with a black face with four diamonds encrusted on the face marking the quarter hours, and a silver bracelet. It was a present from the victim’s partner so has sentimental value too. Although there are no descriptions of the suspects, police are keen to speak to a white male who walked past the victim before the incident. He is described as 28 years of age, 6ft tall, with blond, short spiky hair. He was wearing jeans and blue Lacoste trainers. The victim is a black man. Det Con Mark Cooper, of Sutton’s Burglary & Robbery Investigation Team, said police are keen to hear from this passer-by, from any witnesses who saw the incident, or from anyone who may have been offered the watch. The panel welcomed Sergeant Geraldine Costello, our new sergeant, whom we share with Belmont Ward. The latest crime statistics show Sutton South remains a low crime area and crime has, overall, fallen further, but with a small increase in residential burglaries, many from garages. There is a welcome reduction in thefts from motor vehicles and criminal damage. – support for “Operation Ferrous”, which relates to the theft and trading of scrap metal, a particular problem due to the escalation in the price of scrap metal. The panel discussed “community payback” work by offenders. It also had a discussion of ways of improving how it represents the local community and provides information on its work, to have a better dialogue with the police on behalf of the community. The scheduled police consultative panel meeting that was due to take place tonight in Sutton South Ward of the London Borough of Sutton has been postponed by the police. Councillor Heather Honour and I, the two Liberal Democrat Councillors for the Ward, are concerned at this cancellation, which appears to be due to problems related to police resources. I am writing to you to express our concern and to seek re-assurance that there are not going to be longer term problems with the policing of our Ward. The Sutton South Ward Safer Neighbourhoods policing team used to have its own sergeant. Last year that was taken away from us, when the long-serving Dave Williams retired, and a single segeant was appointed to cover both Belmont and Sutton South. We did not protest at this, since analysis we regularly carry out of crime trends in Sutton South compared to the rest of the Borough show it is a low crime area, and Belmont Ward has similarly low figures. Sergeant Brendan Mcwilliams was appointed. Since then there has been a continuous pattern of change. Sergeant McWilliams is now leaving us and we find that the resources of the team are almost continuously depleted by training and by officers being deployed away from the area to help with operations elsewhere. This depletion is the reason we have been given as to why it is not possible to hold the scheduled meeting of the panel thisevening. We fully appreciate that there are times when local resources have to be offered up to assist in wider policing exercises, and recognise that as the Olympics approach this may happen more often. However, we would be concerned if our area was left with so little cover that normal policing tasks for the community were put at risk, and if this were to impact on crime levels. We would welcome your reaction to these concerns and trust you can put our minds at rest. The Sutton South Ward Panel met on 7 December. Crime figures discussed at the meeting show Sutton South continues to be a low crime area. However, figures for the last twelve months show an increase compared to the previous period in burglaries, though a reduction in thefts from motor vehicles. The increase in burglaries is largely associated with thefts from garages. The priorities of the police for the next three months will be garage burglaries, drugs and anti-social behaviour in the Brighton Road, and thefts from motor vehicles, as we seem to be making good progress in combatting this crime. There will also be a police initiative on people phoning or texting while driving, which is very dangerous. The police also gave information on a number of initiatives associated with drugs and the operation of a brothel. Some issues of concern at earlier meetings, including street drinking, seem to be under control. The police will look out for rough sleepers sleeping in the communal areas of buildings as the weather gets colder, in particular at Beauclere House in the Brighton Road. Responding to an issue raised with him by residents, Richard mentioned an incident of a vagrant sleeping in a stairwell in a block of flats in Grange Road. The police have visited the property. There has been no repetition of the incident. It was agreed to hold a meeting to discuss how to make the panel more representative of the community. Contact us if you have ideas. Crime statistics presented at the September meeting showed Sutton South continued to be a low crime area, though there was concern at the number of thefts from motor vehicles and at a spate of break-ins to garages in the area of the Ward west of the Brighton Road. Police priorities continued to be thefts from motor vehicles and drug dealing. Police would continue to monitor the position on street drinking. Information was given on plans to erect a fence at the rear of the Brighton Road car park and between Sutton Court and Forest Dene. There were plans for a safety leaflet drop warning residents about bogus trades people. Plans were discussed for community involvement in “Speed Watch” to reduce speeding in the area. 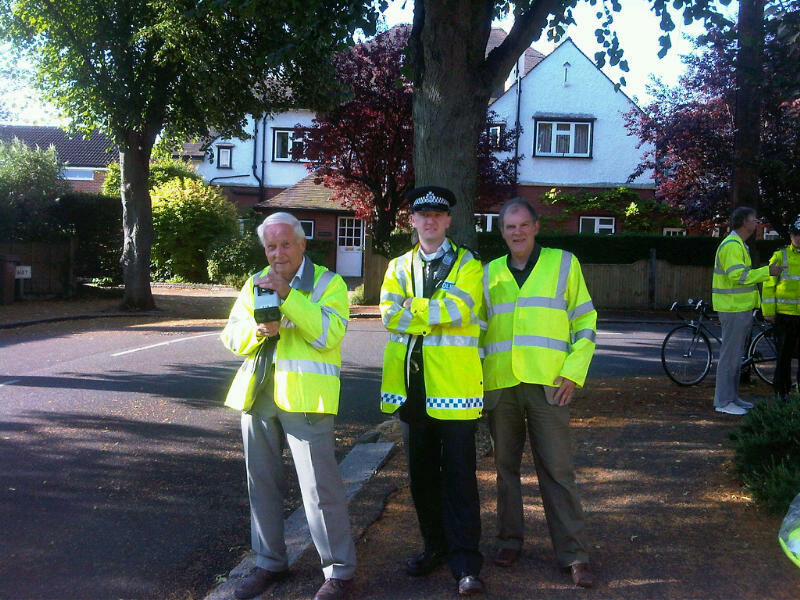 This is a picture of representatives of the Ward police consultative panel, including Richard, undertaking a “Speedwatch” inititive on the morning of 6 July, in The Ridgway, in our Ward. This activity involves checking the speed of vehicles by using a “speed gun”, which you can see being deployed in the picture, and the police warning those travelling too fast.